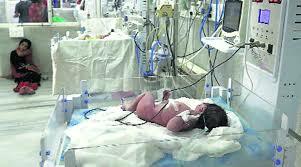 Death of infants in the Civil Hospital of Ahmedabad was due to criminal negligence of the government. Facts and figures in the Comptroller and Auditor General (CAG) report has made it clear that civil hospital of Ahmedabad does not have basic facility for the health of children. The 24 hour child care was needed in the Neo Natal ICU ward. A child cannot complain his problems like fever and vomiting. In view of this, through letters of 18/12/2013 and 12/06/2015, it was suggested that the ward must have high tech facility like 24 hour CCTV. But no such arrangements have been made. The video of the labour ward and neo natal ward clearly supports this claim. In its report, CAG has noted, ICU and trauma care centre were very sensitive for the needs of serious patients. There should be right temperature and measures to ensure that infection does not spread. But the air conditioner of trauma centre is in repair most of the time and there are no dust /air filters which are very important. The inspection report has noted that though grant is available children are not provided fruit juice or any other type of liquid diet. It further notes that cleanliness is not maintained. It has ambulance but it does not have life support system. Government has to take care of pregnant woman from the third month. She is to be provided nutritional diet and iron. But government ignores this and as a result children become victim of malnutrition and die. The care of pregnant women is to be taken by Asha workers and Anganwadi workers. But the BJP government in Gujarat is exploiting these workers. They are paid inadequate wages and are not regularized in their job. Instead of their main job they are engaged in publicity gimmicks of the government.